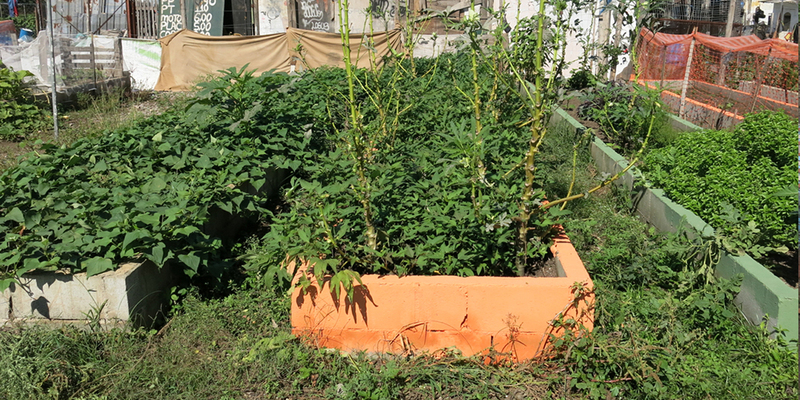 Lea Rekow, Green My Favela, 2014, Manguinhos food garden, Rio de Janeiro, image courtesy of Lea Rekow/ Green My Favela. Green My Favela (GMF) is an environmental remediation project primarily located in the favelas (informal settlements or slum communities) of Rio de Janeiro, Brazil. GMF was formed to reclaim degraded land and to create more productive green spaces. GMF works with favela residents to green what they can through collaborations with individuals, families, NGOs, schools, and the government. The organisation partners with the private and public sector, academics, and social innovators, to remediate neglected and abused land; to cultivate food security; to make more productive, environmentally responsible, and desirable public space; to problem solve for critical needs; and to skill share with a wide range of participants. The GMF gardens are all experiments of one kind or another and all encompass broad social and environmental goals. In the case of GMF’s most ambitious collaboration, in the Manguinhos favela, the aim is to profoundly change the face of this community. The project’s objectives include increasing biodiversity, bringing pride to the community, elevating sanitation levels, reducing trash and pollution, increasing access to fresh, nutritional food, and creating safe and desirable public spaces. 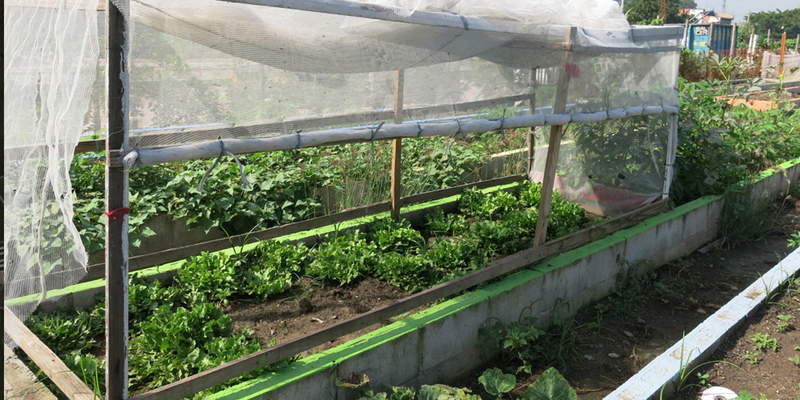 Manguinhos also aims to stretch the possibilities for integrating public policy in ways that encourage networked localism, promote community relations, and showcase the benefits of organic urban agriculture. It strives to provide a progressive platform formulti-tier collaboration, collective ownership, and self-management. 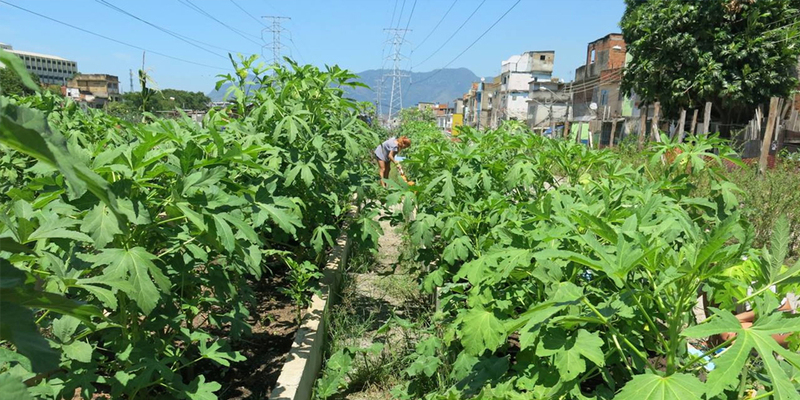 The gardens increase the communities’ access to healthy, fresh fruit and vegetables, ensuring better food security, food sovereignty, and a nutritional diet. In mid-2014, the Manguinhos garden was cultivating over 300 garden beds that produce chicory, kale, tomatoes, eggplant, peppers, green onions, lettuce, okra, beets, spinach, and a range of herbs. The improvements to physical space provide a therapeutic environment that helps reduce stress. They provide centers for the local production of food and other useful plants (e.g. medicinals), which also provides opportunities to develop agricultural skills, provide leadership training, promote knowledge exchanges, and positive social experiences. They also provide occupational activities for intergenerational participants — the elderly and others (for example, those in drug rehab. ), and particularly youth, who come under great pressure to participate in the culture of drug trafficking. The gardens also discourage the abuse of land, provide a platform to engage with environmental and nutrition education through school and individual participatory activities for both children and adults. The gardens strengthen interpersonal and community relations, and create a culture of proud farmers. Knowledge generation about the production and the consumption of produce, greater knowledge about the natural environment, (and threats or risks to it), practical experience in growing techniques, and awareness and stewardship of the environment, are other beneficial outcomes. The gardens provide a great aesthetic improvement to urban areas that are characterised by extreme poverty, pollution, and risk. They provide a cleaner, pleasant-smelling, beautified environment and a therapeutic physical atmosphere for productive community use. Because the gardens are co-produced with residents, from the beginning of the process they aid in improving the social culture of public space. 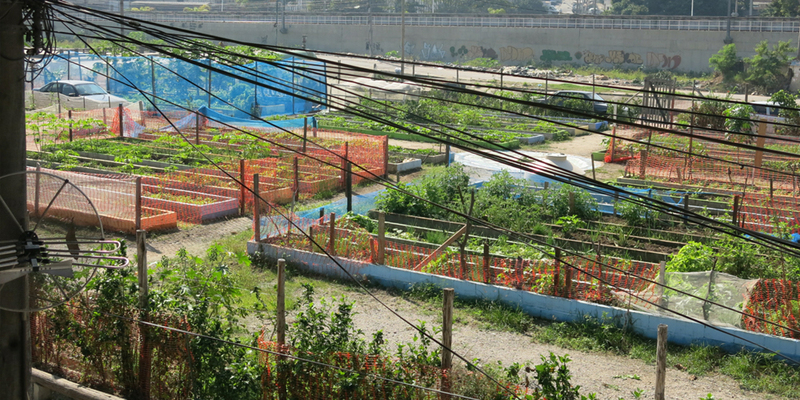 The gardens also bring recognition, appreciation and pride of public space, which are unfamiliar concepts in favela-life. 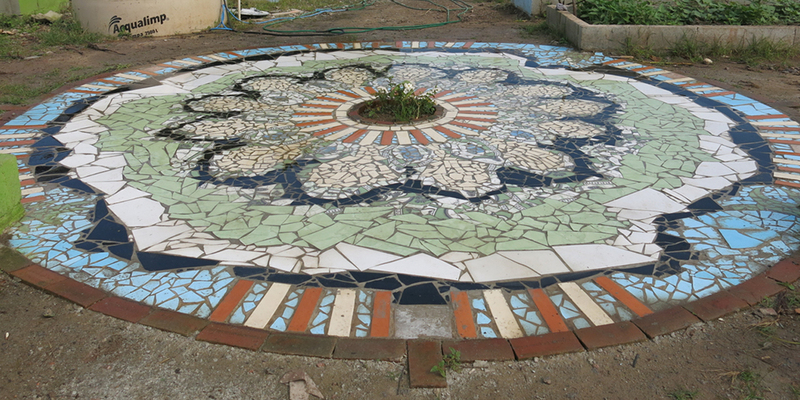 The project also celebrates local knowledge, creativity and the ingenuity of residents. Further, it promotes collaboration across socio-cultural strata. The economic dimension of the project brings with it income generative opportunities, land tenure security, the promotion of solidarity and self-management, production by collective ownership, and network and policy building through joint collaboration between different ventures. On an ecological scale, the benefits the gardens bring include: pesticide-free food; mitigation of the presence of trash; improvement in air quality and reduction of other pollutants; the reduction of vermin infestation; the productive use of food waste; a clean water source for the community; an increase of biodiversity; increases in water absorption into soil which reduces erosion; and the prevention and control of disease through a more sanitary environment. The GMF project began as a community collaboration in the Rocinha Favela of Rio de Janeiro. GMF’s pilot project was built using private donations and volunteer labour on chronically degraded land. It immediately drew the attention of Rio’s State Department for Human Rights and Social Assistance and was subsequently showcased at the 2012 United Nations Rio+20 Summit on Sustainable Development. GMF then began receiving increased attention from resident and government stakeholders who were interested in establishing gardens in favelas. 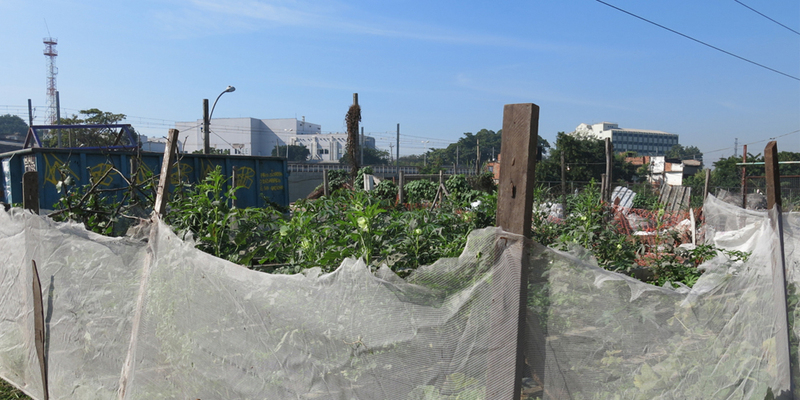 GMF has established twelve gardens in four favelas, in both the North and South Zones of Rio. Some gardens have flourished, others have collapsed due to a variety of circumstances that make the favelas a precarious and fragile landscape to work in. These circumstances include extreme violence associated with police occupation and conflicts involving drug trafficking, and spaces being bulldozed or enclosed by the State. GMF faces many difficulties because the gardens are located in extreme conditions in areas of intense social exclusion, state abandonment and neglect, and armed oppression. The organization continues to build trust over time with residents and institutional collaborators through a sustained commitment to being active and present in the favela work spaces. GMF embraces an informal, horizontal organizational structure to facilitate and help favela residents establish productive green spaces for themselves. GMF does not rely on major financial or institutional support, but rather prioritizes working on-the-ground with motivated local residents. Because of this, there are few constraints on getting the work done other than the precarious reality of the favela itself. GMF does collaborate with institutional partners, and accepts non-corporate financial donations that are used to invest in the infrastructure-building aspects of the project and to support ongoing maintenance. We also mediate between residents and policy-makers, and facilitate academic researchers and students. Working within the economic structure of the favela, much consideration went into the selection of materials. Materials are chosen because of their low cost, their ability to withstand serious threats from flooding, their low environmental impact, and their capacity to mitigate pollution. Because the projects are conducted in favelas, most work is done manually. This means there is very little energy or resource waste, either in construction or in operations, so the environmental footprint is low. 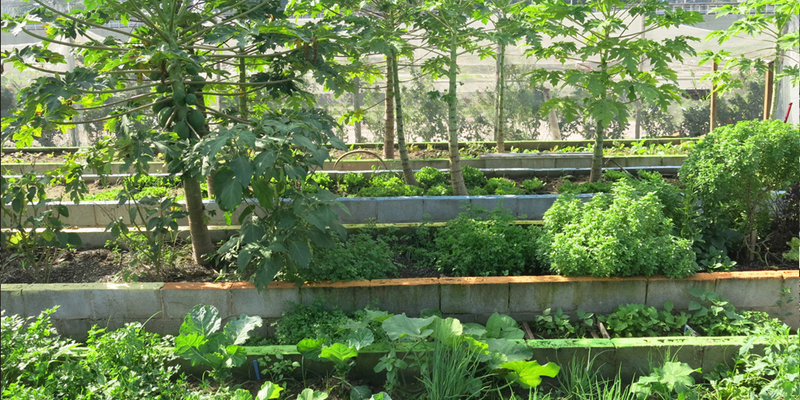 The gardens are designed for use, production, and distribution to and for the local community. Rekow, Lea “Green My Favela: An Act of Defiance” International Journal of Education Through Art 8 (3), 2012. Eisenhammer, Stephen “Rocinha Mais Verde at Rio+20.” The Rio Times, 29 May, 2012. http://riotimesonline.com/brazil-news/rio-politics/rocinha-mais-verde-ngo-at-rio20/# (accessed January 22, 2014). Villela, Flávia “Projeto Rocinha Mais Verde quer ensinar crianças a cultivar alimentos orgânicos.” Agencia Brasil, 26 May 2012. http://memoria.ebc.com.br/agenciabrasil/noticia/2012-05-26/projeto-rocinha-mais-verde-quer-ensinar-criancas-cultivar-alimentos-organicos (accessed January 22, 2014). Rossi, Eliano “Favela eco-sostenibile grazie a riciclo e orti urbani.” Sky (Italy), 15 November 2012. http://tg24.sky.it/tg24/eco_style/2012/11/15/riciclo_orti_urbani_green_my_favela_rocinha_rio_de_janeiro_brasile_eco_sostenibile_.html (accessed March 12, 2014). Forte, Jay “Rio’s 10 Most Interesting Gringos of 2012.” The Rio Times, 25 December 2012. http://riotimesonline.com/brazil-news/rio-politics/rios-10-most-interesting-gringos-of-2012/ (accessed 19 November, 2013). Polli, Andrea “Green My Favela and 596 Acres.” Social Media Workshop, UNM Center for Advanced Research Computing, website post, no date. http://socialmedia.hpc.unm.edu/?p=1305 (accessed July 12, 2014). Parnell, John “Sustainability in the favelas: Swapping guns for gardens.” Responding to Climate Change, August 14, 2012. http://www.rtcc.org/2012/06/13/sustainability-in-the-favelas-swapping-guns-for-gardens/ (accessed February 12, 2014). Guignard, Elodie “A Rio, les joies du jardinage au cœur de la plus grande favela du Brésil.” You Phil (France), 22 June 2012. http://www.youphil.com/fr/article/05424-a-rio-les-joies-du-jardinage-au-coeur-de-la-plus-grande-favela-du-bresil?ypcli=ano (accessed February 12, 2014). Howard, Brian Clark “Tour of Rio’s Favelas Shows Hope and Ingenuity.” National Geographic News, 20 June, 2012. http://newswatch.nationalgeographic.com/2012/06/20/tour-of-rios-favelas-shows-hope-and-ingenuity/ (accessed March 3, 2014). Molinari, Lisa & Melissa Rossi, “Rio+20 Events in Favela Communities.” The Rio Times, 19 June 2012. http://riotimesonline.com/brazil-news/rio-politics/rio20-events-in-favela-communities/ (accessed April 12, 2014). Watts, Jonathan “The Rio favela transformed into prime real estate,” The Guardian, 23 January, 2013. http://www.theguardian.com/world/2013/jan/23/rio-favela-real-estate (accessed March 3, 2014). Thomas, Chip “Brazil is Now. Jetsonorama in Rio.” Brooklyn Street Art Blog, posted 10 January, 2013 http://www.brooklynstreetart.com/theblog/2013/01/10/brazil-is-now-jetsonorama-in-rio/#.U_HfcGPgWSq (accessed July 12, 2014).